I haven’t posted in a while, and I must give an explanation. Last week I went to the bottom of the earth—Patagonia. I spent 4 glorious days hiking around the national park Torres del Paine, seeing some of the most incredible and breathtaking landscapes earth has to offer. It was a perfectly smooth trip and I honestly couldn’t have asked for anything more. I returned, ready to tell my story to the world. But missing basically a full week of classes grounded me a bit, as I had a lot of work to catch up on. All of last week, while I wanted to shout to the world that Patagonia had been the most glorious trip I’d ever taken, I needed for the first time since I’ve been here to actually study. This weekend I felt for sure my opportunity to blog about my hiking experience would come to light, but then I had such a cultural experience that I felt I had to share that over my trip to Patagonia. While I learned so much about myself on my trip to Patagonia and feel that I have come back refreshed and ready to take on new challenges, this weekend was the first time I felt that I have become completely assimilated with the culture here in Chile. This week is called Semana Santa in Latin America, and celebrates the time in the Church when Jesus died and was resurrected—better known as Easter in the States. While Chile has a very strong Catholic influence, that can be traced back all the way to its independence, many people here are not religious. Catholic churches are scattered across the city with at least one church per street, yet many Sundays they remain less than full. My host mom is the exception. She goes to church every Sunday; and I’ve had the pleasure of going with her once before. Being Catholic myself, this was also an important holiday for me and I was very curious to see how it was celebrated here. Although Semana Santa indicates it is a week long, in reality it is only a long weekend—Friday to Sunday. All the businesses and schools close for Friday in remembrance of Jesus’ crucifixion. I asked my mom on Thursday if there was a service for Good Friday. It’s my favorite mass in the States and I assumed since all the schools and businesses were closed there would be a big service. However, she admitted she wouldn’t be going to any and didn’t even know when they were. This took me back a little bit. That Friday we ended up having a day spent with all my host mom’s family, going to the cemetery with her brother and sister to visit their mother’s grave. We had a big lunch afterwards with lots of wine and champagne to celebrate Semana Santa. I felt so glad that they had invited me to share this special day with their family and for the first time, I felt like I was becoming apart of the Chilean culture. After lunch, I decided to walk around my neighborhood a bit, hoping to find a park where I could sit under a tree and read. I ended up finding a small park and yes, I did read for a bit. But after about a half hour a group of young girls all dressed in black stepped out of a car and into the park. I thought it might be a funeral of some kind but then behind the girls a man stepped out dressed in a white robe with a red sash thrown across his chest and a crown on his head. There were a few other boys dressed in a similarly interesting fashion. I now remembered my mom telling me about this earlier that week. 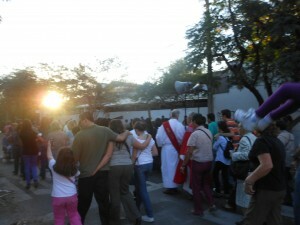 There were processions given by the young people of Santiago on Friday to represent the crucifixion. I decided to go over and check it out. A bunch of people had now gathered around the kids and I could pick out amongst all the robes, that there were a few older people—priests. All at once everyone began singing and when they were finished the priest read from a sheet of paper. I picked up that they were going to reenact the stations of the cross. 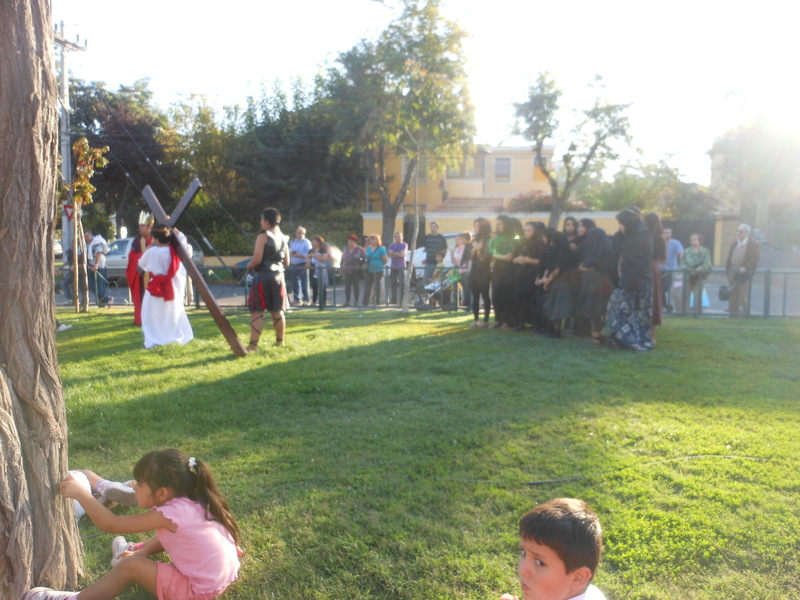 After they read the first station and the kids, who I now understood were playing Jesus, Mary, and other various characters from the crucifixion, had acted out their parts, the assembly moved to the end of the park, singing as they went. I figured they would move around the park, I would probably watch for a few minutes and then leave. The procession ended up walking around the city for about 2 hours, reading each station of the cross as they went and praying in between. I, although I thought I would only stay for a few stations, ended up following the whole way until they ended at a church on a street I’d never been on before. I was really happy that I had the opportunity to watch this cultural experience. In the end it appeared very similar to the mass given on Good Friday in the States, with only slight differences and the obvious fact that it was outside walking around the city. I had enjoyed myself so much and at the end of the day felt like a true Chilean. When I returned home, my host mom informed me that we would be going to mass the next night, on Saturday. I was a little surprised by this because mass in the States for Easter is always on Sunday, not Saturday. My mom explained to me that there are two masses, but the one on Saturday celebrated the resurrection of Jesus while the one on Sunday was just a normal mass. The next night, we attended the Easter Vigil mass, which they call la Resurreción here. The mass was completely different than any other Catholic mass I had experienced before. At first they turned off all the lights in the church to symbolize that Jesus had died. After singing a song, the priest came down the aisle from the back of the church lighting the candles that everyone held in their hands. They church began to light up with these small flames, illuminating everyone’s faces as they held them. They continued to sing but now with more vigor than before. Everyone was so happy. From the way they sang and how they moved the candles slightly back and forth with the rhythm, I could feel the love for God in the air, the pure joy that he had risen and saved the people. It was a truly beautiful moment where I can honestly say I felt so blessed. I’m not a person to outwardly speak about my faith, but in that moment I felt closer to God than I had ever felt before. The mass continued with readings from the bible, that for the most part I didn’t understand. But with each song in between the readings the people expressed their devote love to God and in those moments, even when I couldn’t understand one word they were saying, I felt the love in the air and my own soul lighting up with the joy of the moment. I left feeling completely renewed and thanking God that he had given me this divine experience. It is something I will remember forever. I got the blessed opportunity to see the Chilean people in their raw form, and even if most of those people only go to church on Easter, I could see that they still had a faith and love for God that ran deeper than any Catholic faith I had witnessed in the States.